Posted by Mollie Hamelund on February 11, 2019 in Basketball, Sports, Top Stories. 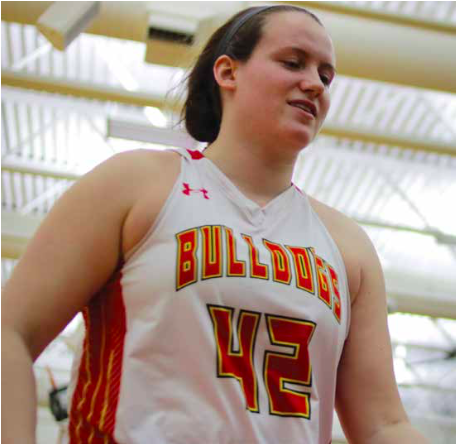 Ferris women’s basketball head coach Kendra Faustin said she doesn’t think there’s anyone more suited to be a coach than Ferris senior forward Abby Nakfoor. Nakfoor, an accounting senior, had planned on becoming a head coach after graduation and was selected to attend the three-day program, “So You Wanna Be a Coach,” held by the Women’s Basketball Coaches Association April 3-5. This is the event’s 17th year and it provides a learning opportunity to young women around the country who aspire to be a coach. Nakfoor was excited to learn about the opportunity she was given and is one of two women from the Great Lakes Intercollegiate Athletic Conference going to the coaching workshop. Nakfoor came to Ferris after playing volleyball and basketball at Dewitt High School, and she credits her head coaches for her motivation to be a coach. Nakfoor has been on the Ferris women’s basketball team for all four of her years at the university. Nakfoor helped the team last year in getting to the GLIAC tournament semifinals and hopes to finish her final season with the Bulldogs strong this year. Faustin expressed her excitement for Nakfoor to represent Ferris at the program and said she is happy that Nakfoor can represent Ferris anywhere she goes. The program is intended to provide connections with people already successful in coaching, according to Faustin, and she believes Nakfoor is a natural coach. The purpose of this workshop is to teach the young women coaching ideas and strategies, but it’s also looked at as a way of networking. Nakfoor has also worked with coaching kids for Ferris by helping run the Ferris basketball camps. She is looking to one day be the head coach of a high school basketball team. Bush and Nakfoor played together on a travel basketball team before playing four years at Ferris together. Bush also said that Nakfoor follows the core values of the team and is excited to see her represent Ferris. Nakfoor has played an average of 5.3 minutes per game and had 1.3 points per game this season.